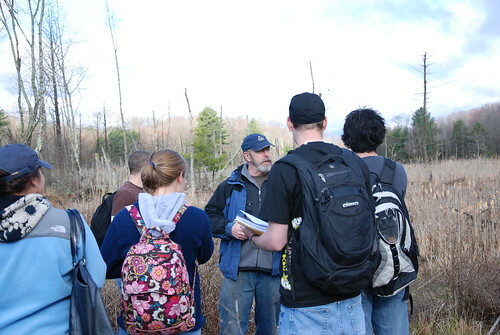 Professor Jack Clausen (facing the camera) teaches an undergraduate course on wetlands biology and conservation. As evidenced by the name, faculty in the Department of Natural Resources and the Environment (NRE) focus on management and conservation of our planet’s limited natural resources, including earth’s water and climate system, air quality, forests, fisheries and wildlife resources. “Our departmental research mission statement is to contribute to the solution of environmental problems, to increase understanding of natural resources systems and to enhance the wise and sustainable management of these resources,” says Jason Vokoun, associate professor and interim department head. In addition to offering undergraduate and graduate science degrees in natural resources, the department participates in the multidisciplinary, multi-departmental environmental science and environmental studies degrees. “Our department is heavily invested in these majors, and our course offerings feature prominently,” Vokoun notes. He also serves as the current director for the environmental science major. The undergraduate natural resources major includes four concentrations: environmental sustainability and conservation; fisheries and wildlife conservation; sustainable forest resources; and water resources and climate. Students in this major build depth through choosing from the concentrations, which are aligned with career fields. NRE graduates tend to find employment in one of three major areas. The largest number work for state and federal environmental agencies such as the United States Forest Service, United States Fish and Wildlife Service, United States Environmental Protection Agency (EPA), and the state counterparts of these agencies, such as the Connecticut Department of Energy and Environmental Protection (CT DEEP). The second major area of employment for NRE graduates is environmental non-governmental organizations, ranging from smaller local land trusts and watershed groups to global organizations like The Natural Conservancy, National Audubon Society, Trout Unlimited and World Wildlife Fund. 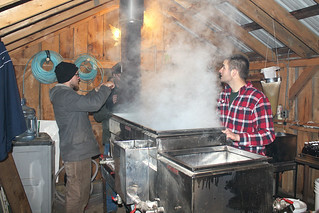 Members of the UConn Forestry and Wildlife Club make maple syrup in the department’s sugar house from sap harvested from the UConn Forest’s sugar bush. Currently research in the department is funded by more than $12 million in extramural grants. Major areas of research are water and wetlands; forestry and forested ecosystems; fisheries and wildlife conservation; and geospatial technologies and remote sensing of the environment. And, while environmental research starts in the field, technology is playing a larger role. Many projects now rely on camera traps or aerial sensors to assist with gathering data. A National Science Foundation (NSF) funded project based on the Natural Resources Conservation Academy, designed to advance informal STEM learning, led by former department head, Vice Provost for Academic Affairs John Volin. Another NSF-funded study, this one multi-institution, to determine how stream warming affects ecosystems by artificially heating sections of streams. Assistant Professor Ashley Helton is the UConn lead investigator. A partnership project funded by the US Department of Agriculture (USDA) to trace E. coli contamination sources in surface waters led by Professor John Clausen. An EPA/Long Island Sound Study-funded project examining effects of sea level rise on coastal marsh vegetation and ecosystem services, led by Assistant Professor Beth Lawrence. A CT DEEP Wildlife Division-funded project to survey people’s attitudes about black bears, led by Assistant Professor Anita Morzillo. 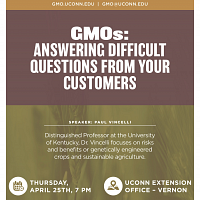 Many of the department’s outreach projects involve partnerships with UConn Extension. 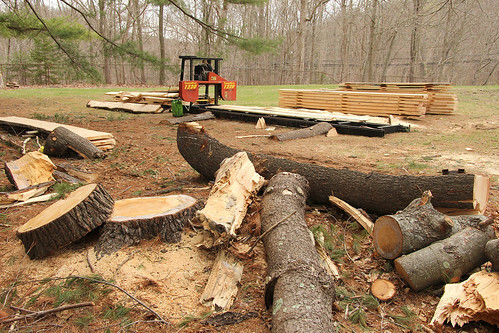 The department’s portable sawmill being used to cut lumber from wind-damaged pine at the Middlesex County Extension Center. 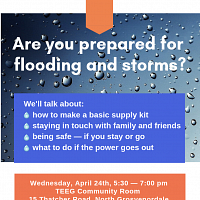 The Stormwise program is another collaboration between NRE, Extension and the Eversource Energy Center. The program was designed to help communities determine how to handle the forest/road/power line interface through alternative forest management practices and proper tree selection and placement. 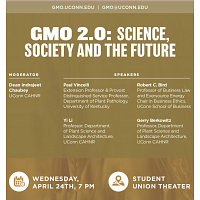 There are demonstration sites around the state, including the UConn Forest in Storrs. The Natural Resources Conservation Academy (NRCA), established by Volin, is the primary means by which NRE provides environmental education to high school-aged youth. The base programming involves a ten-month program during which students come to campus for a week-long summer field experience to learn field work skills, including the use of geospatial technology to collect environmental data, then perform an individual community conservation project near their home. NRCA also offers short workshops for students, adults and teachers. 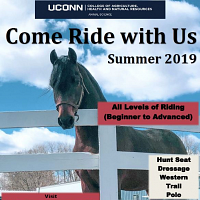 The program is now a partnership of NRE, CLEAR and UConn’s Center for Environmental Sciences and Engineering, with generous support from several private donors through the UConn Foundation. This entry was posted in Environment, Extension, Faculty, Research, Stories.